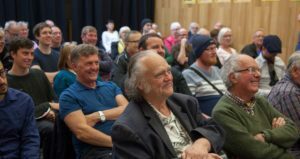 “Whilst it is true that the Yes movement has spent too little time reflecting on, and learning why, we lost the 2014 referendum, it is also true the conclusions drawn by Andrew Wilson’s Sustainable Growth Commission (SGC) would never have galvanised the broad coalition of support that was marshalled behind the Yes Scotland banner and secured 45% support. I can assure Andrew Wilson the Scottish Socialist Party, one of the three parties in Scotland who support Independence and a co-founder of Yes Scotland, the Radical Independence Campaign, nor the others on the Left/Centre Left of the Yes movement would have backed his ‘right of centre’ economic plans. Andrew claims his Commission seeks ‘to challenge orthodoxy’ and yet it reaches conclusions which have at their heart neo-liberal free marketeering which is falling apart worldwide. The SGC Report is not ‘challenging orthodoxy’ in any sense, rather it parcels up the same economic dogma, doubtless learned from many Royal Bank of Scotland policy forums, and presents them as the freshest of fresh thinking. He proposes no progressive tax policies such as those employed in the Scandinavian countries he so admires. He ignores the lessons of New Zealand where low taxes, low wages and the influx of Chinese capital have crippled the Auckland housing and labour market. And he recommends Scotland’s public spending levels are cut when our hospitals, schools and railways are already failing not least under the weight of PFI schemes including the SNP’s Scottish Futures’ Trust he would have recommended for not appearing on the Governments books. Andrew Wilson’s Sustainable Growth Commission is, as I have said on many occasions since its release last summer, ‘straight out of Tony Blair’s New Labour playbook. It posits mythical productivity improvements that cannot be achieved without massive investment in training and new technology. It is based on recruiting skilled workers from abroad at cheap labour rates to work below a just level of remuneration. 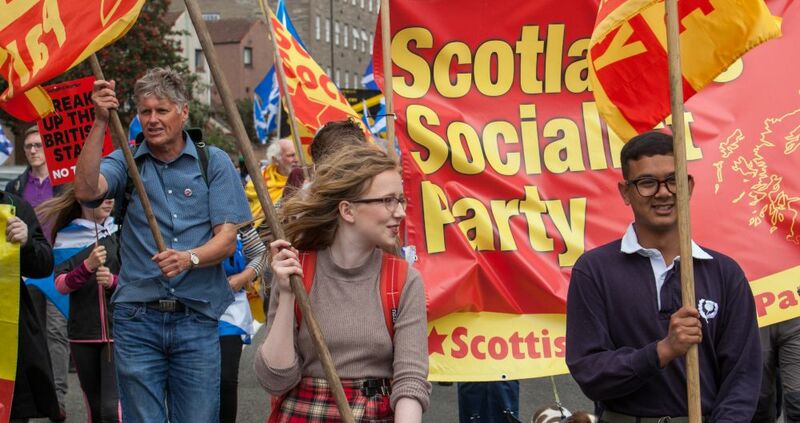 The SSP consistently campaigns for a living wage for all. 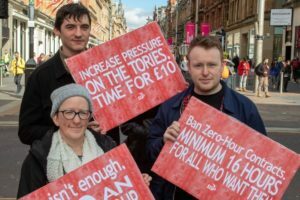 £10 an hour, rising with inflation. It proposes savage cuts in public services already unable to adequately serve the interests of our most vulnerable citizens. ‘There is not a hope in hell that this Report could command majority support in Scotland today. It may be what Edinburgh financiers, Aberdeen oilmen, Glasgow businessmen and big Galloway farmers are looking for.